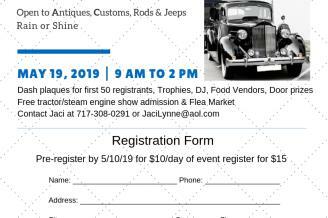 This historic 90-acre facility hosts a variety of events throughout the year including a weekly Farmer's Flea Market, spring car show and annual Steam Show. One of the most unique features is the operating full-size steam railroad takes riders on a 1 mile trip around the perimeter of the show grounds. It is the only surviving, running Pennsylvania railroad engine. Many Gas Tractors of all ages and types. An Operating Steam Boiler House featuring several large stationary steam engines! Outdoor Saw Mill, watch logs become lumber! Williams Grove Historical Steam Engine Association's purpose is to preserve steam powered equipment and educate the public about the history of farming. The association uses steam engines for plowing, harvesting and sawing, has early gas engines and tractors, and a PRR steam locomotive engine. Other: Week-long Steam Show and other special events throughout the year.